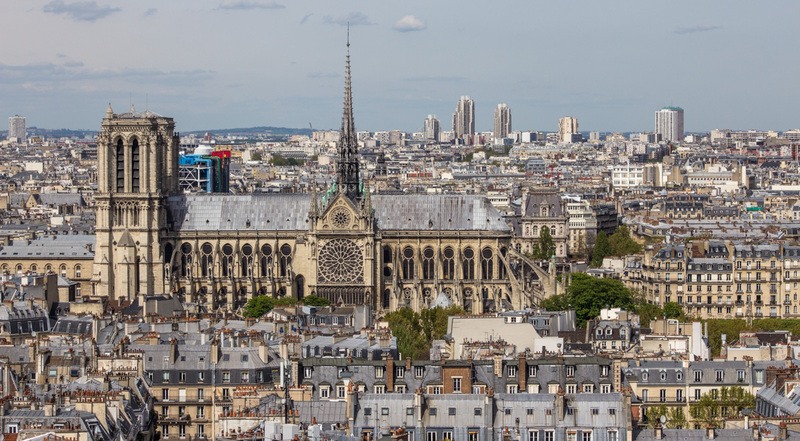 By now everyone, or nearly everyone, has heard or seen reports of the fire that destroyed the roof and spire of the cathedral of Notre Dame in Paris. Ken and I watched it live on television last evening, mesmerized by the spectacle, sickened by the horror, and emotionally exhausted by the near loss of one of the most famous and familiar of the monuments in a city we've both come to love. An April river cruise in 2018, a view of the cathedral from the east. Those firefighters did hard battle against an enemy much larger and stronger than themselves. It seemed futile from our vantage point on the couch, but they persevered and eventually brought the fire under control and saved the north tower (and its bells) from the flames. The best news is that nobody was killed in the conflagration. The spire is gone as is the totality of the gray roof. I don't know how many of the windows were lost. Photo from May 2016. Now the task turns to cleanup and planning for what is to come. The president has said that France will rebuild and, since the cathedral's structure seems to be intact, that's probably likely. But it will take years to clean up the damage, years to design and engineer a new roof structure, and perhaps decades to completely rebuild. 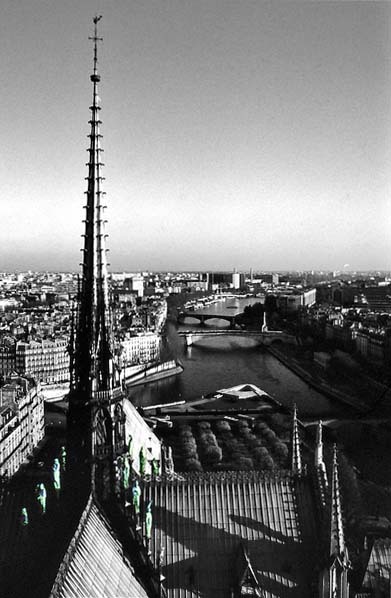 A 1988 photo of the spire, now gone. The statues on the roof had been removed a couple of weeks ago for restoration. These are two of my most recent photos and one old favorite of the cathedral. 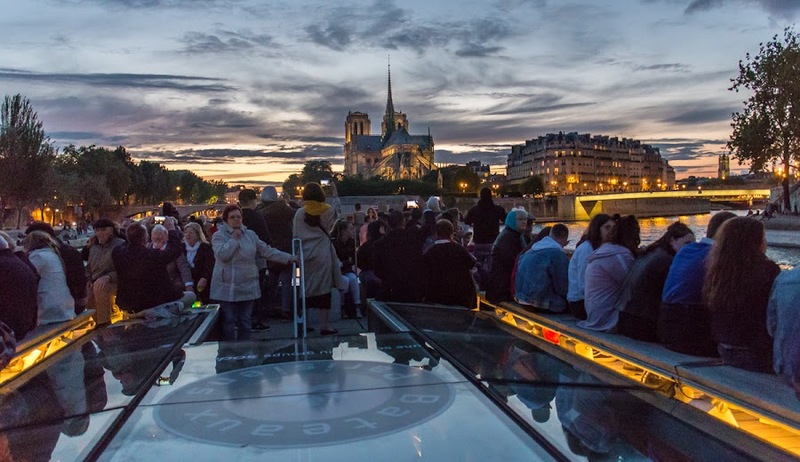 The first is from one year ago, taken from a tour boat during an evening cruise on the Seine. The second is from 2016, taken from the dome of the Panthéon on the Left Bank. The third is an old slide taken from the top of the south bell tower when Ken and I visited Paris in 1988, I think. A vicious punch in the gut for many millions of us, Walt. Who could have imagined this ever happening? My sincere commiserations to all French people and those resident in France - in fact everyone with a capacity for appreciation of the truly finest works of 'art'. Sad, sad time. We braved the line and went in during our last visit, when we saw you. As Ken noted, we'll probably not see the fully-restored cathedral. très triste ce matin comme beaucoup de gens de par le monde... merveilleuses photos, merci à vous. Heartbreaking for the people of France and millions more around the world. I only saw it once in 1974 and loved it so much. You said it perfectly. Our last visit--inside and all the way to the top--was in May 2017 with our grandson. We are heartbroken. Your photos are so good. I climbed up to the top many years ago, now many won't have a chance to see the beauty that is up there. The roof is longer than I remember it being- what a fire that was! Tears streamed down my face as I watched the raging fire. We think these iconic landmarks are protected somehow. But yesterday was a reminder of how quickly it can change and how hard it is to watch. I'm glad to see the billionaires stepping up with their donations, but you're right when you say it will be years and years to rebuild this magnificent cathedral. Thanks for the photos and the post. I love the photos from the viewpoint of your river shot. It looks from there like a great ship on the river. I've been reading mentions of other cathedral and monument fires, and it sounds as if they might be able to effect repairs in perhaps ten years. The entire structure was mapped electronically not too long ago, so there are detailed pictures of everything. paris is stronger than any fire; ND shall rise up from the ashes!